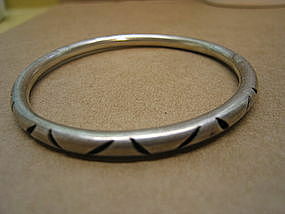 Vintage slip-on bangle bracelet marked TS-12D Mexico 925. The band is 1/4 inches and has interior size width of 2 5/8 inches. There is no damage. The companion bangle, with a complimenting design, is also available, and listed as M-8031. I need your zip code to calculate the postage.